The Hario Woodneck Dripper Pot is a simple pour-over manual brewer with a real 'cool' factor. It is made with natural, yet durable elements such as wood, glass, and cloth which gives it style and sensibility. The heat-resistant wooden collar not only looks nice but it serves as a way to hold the carafe when pouring, without transferring heat to your hand. The wood collar is secured by a leather strap as seen in the photos. 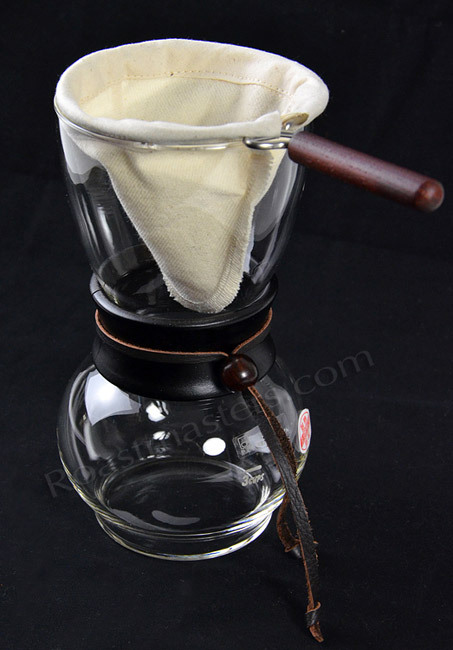 The cloth filter is a great, ecological alternative to single use paper filters, and it does not emit any flavor or odor that might distract from the great tasting coffee this dripper produces. The filter cloth is attached to a ring on the handle and it can be removed for cleaning or replacement, if desired. The woodneck includes a measuring scoop with marks for 8, 10, and 12 grams so that you can accurately add your coffee grounds for the perfect cup. 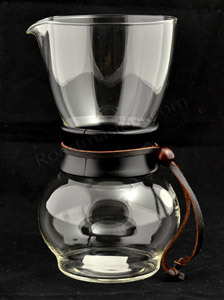 This brewer has a capacity of approximately 16 ounces (480ml). Link to the manual, in English. Model DPW-3.